Software startups are increasingly under high pressure to deliver successful products to survive and thrive in the modern highly competitive technology market. Larger organizations with deep pockets can replicate the same business ideas used by startups with relative ease. So how does the average startup stand a chance at succeeding at this seemingly David vs. Goliath contest? This article looks at the available literature and identifies such factors that can affect the success of software development startups. Using causal loop constructs from the field of system dynamics, the interactions among the various identified factors are visualised to reveal the dynamics of the system. The result is as a three-dimensional view of success factors in form of time, capital and (product) differentiation. The modelled system is then simulated, and the resultant trend is reviewed and interpreted. This research acts as ground work for analysing the workings of software development startups and sets the stage for a more holistic study of the area, upon which further research can be carried out. In recent times, startups have disrupted the status quo and taken the market by storm with new, innovative products and services, which attempt to simplify everyday tasks in both business and personal spaces. From a product or service perspective, most software startups face stringent resource constraints (Fayad et al., 2000) such as time (Paternoster et al., 2014), human resources and finances (Song et al., 2010). Additionally, startups need to be flexible and steadily evolve to stay relevant in the modern rapidly changing technology landscape (Duchesneau and Gartner, 1990). To this end, there is evidence to support the adoption of adaptable process frameworks like lean startup methodology among newer startups (Ries, 2011). There is also a good amount of interest in research directed towards startups, particularly in software development sectors. However, the software industry has some of the highest failure rates when compared to most industries. Therefore, an in-depth study of the factors that can lead to better insight on factors that influence success of a product development undertaking in an aspiring software startup and would merit further study (Davis and Zweig, 2005). Startups and the processes such as product development within it, can be considered as an example of a Socio-Economic or Socio-Technical system (Groen et al., 2008) and the complexities involved in such systems cannot be studied easily by most tools and techniques which view the problem at hand from a linear or deterministic viewpoint. According to reviewed literature, such Socio-Economic or Socio-Technical systems fall under the category of multi-loop non-linear feedback systems (Forrester, 1971). Forrester goes on to state that, as a consequence of the human evolutionary process, humans have not evolved to be good at understanding the dynamic behaviour of such complex systems. To add to this, a study found that policies and solution which have their base in linear viewpoints tend to produce solutions of a temporary nature and a higher amount of escalating problems (Holling, 2001). However, simply studying the various factors by isolating each one from the entire system might not be sufficient to provide enough insight. 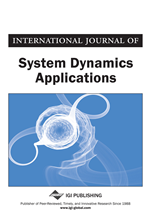 As an example, with a Socio-Technical system, one case can be considered (Tvedt and Gollofello, 1995), where system dynamics has been used to evaluate software development cycle time for effectiveness. In this study, in place of studying each factor for effectiveness in isolation, the study considered the various factors that would collectively affect the entire system. For instance, if a new software tool was introduced to a company with the intention of reducing cycle time of software development, this might reduce the amount of time the professional (using the software) needs to be involved with that task. However, the time gained by quickly accomplishing this task using the software tool might be spent as slack time by that professional. Therefore, there might be no real benefit or change to the cycle time, which was the original intention of introducing the software tool in the first place. This illustrates that a coordinated study of the various factors should be done in unison and in advance, rather than in isolation done later. By introducing an intervention such as a new software into a system and then modelling how the various elements of the system will be affected can help understand the positive and negative implications better. This is especially relevant in the case of software startups since failing to understand such implications can lead to an increase in cost, effort needed in product development and subsequently, time to market.